From a casual Tweet, to a young Etsy business, to Frank Ocean’s wardrobe, and finally to a nation-wide trend. Walking through the VCU campus, I’ve observed people sporting the famous “Why be sexist, racist, homophobic or transphobic when you could be quiet?” t-shirt. The shirt was brought to my attention once again when my sister asked if she should wear hers to the VA Pride Festival. At this point I began to think about the ways young people wear their politics, as it seemed like the shirt was following me everywhere. After attending VA Pride, and seeing a handful of people sporting the slogan, I wanted to find out exactly where it came from. 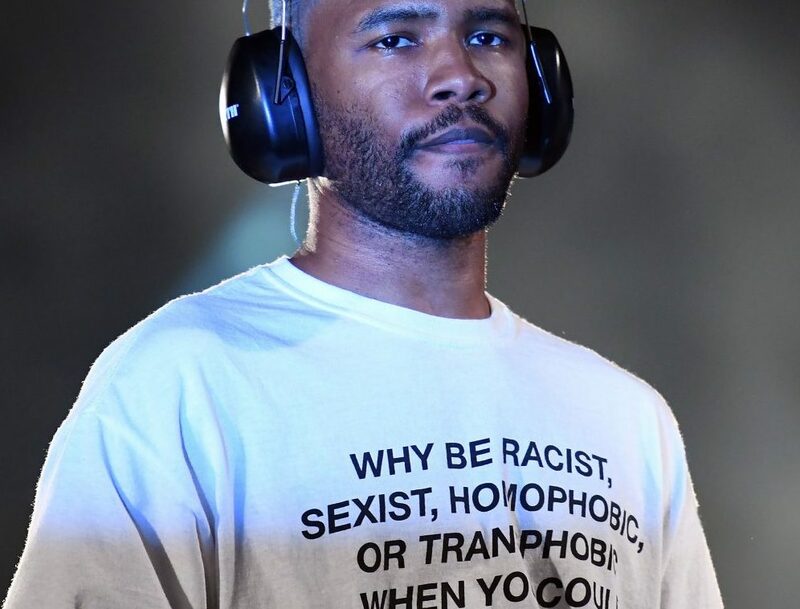 On August 8, 2015, nineteen year-old Brandon Male tweeted, “why be sexist racist, racist homophobic, or transphobic when you could bE QUIET,” but never foresaw it to going viral, that soon Frank Ocean would be wearing it on stage, or that it would become a closet staple for the “woke” college student. 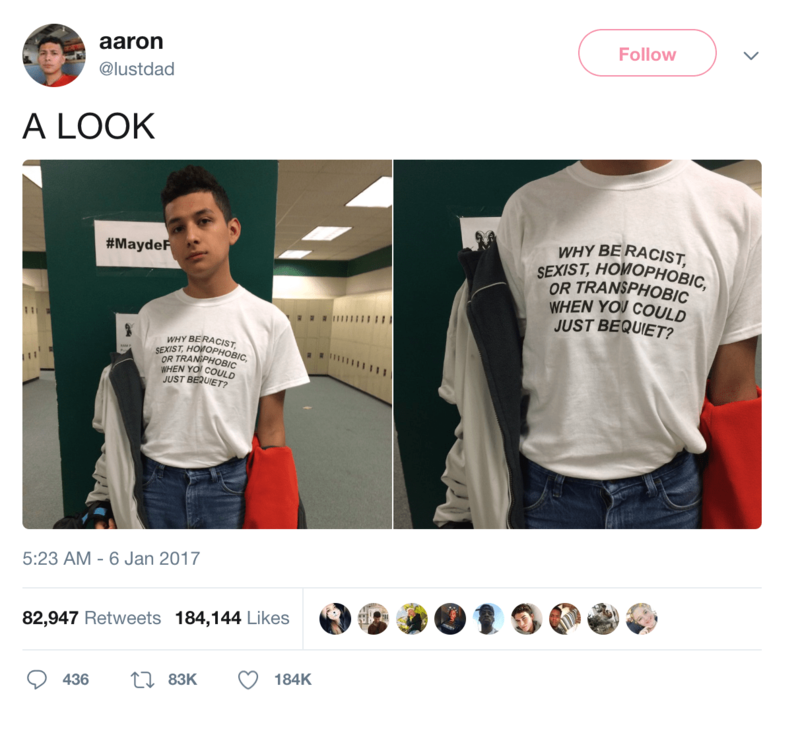 In January 2017, it came to Male’s attention that a tweet containing photos of a student wearing a t-shirt with his own quote on it had gone viral. Even today the photoset has gotten more attention than his original tweet. Male learned that the shirt was being sold by an Etsy store called the Green Box Shop. In July of 2017, photos of Frank Ocean wearing the shirt began to circulate following his set at Panorama Festival, in New York City. Messages of praise towards Ocean and questions about where fans could buy the t-shirt flooded the internet. Today you can still buy the shirt from the Green Box Shop, but you can also buy it for a fraction of the price from dozens of sellers on Amazon and Redbubble. The story behind the shirt raises questions about intellectual property and fashion ethics in the age of social media. It prompts us to think of the ways people with little influence are taken advantage of by bigger companies. As consumers we have to take note of the ways companies monetize political opinions. If a brand is using quotes like this for the sake of sales does it take away from the values behind it? Or does the message outweigh the intention behind its creation? Nevertheless the message behind the quote seems to have resonated with millions of young people around the world and is no doubt a reflection of the times. Though Brandon Male never intended on the quote’s widespread influence, it’s clear that it wouldn’t have ended up in so many young people’s closets if it wasn’t such a timely and powerful statement. After all, why would you be all of those nasty things if you could just be quiet?